These rooms, located on floors 1 through 4, have contemporary Mexican décor and are situated close to the restaurants and beach. They feature gorgeous views of the gardens or partial views of the beach. The amenities include a minibar restocked daily, a coffeemaker, cable TV, and air conditioning. $ 409	$ 196	1 Room Total 4 Nights $ 782Taxes and fees not included. 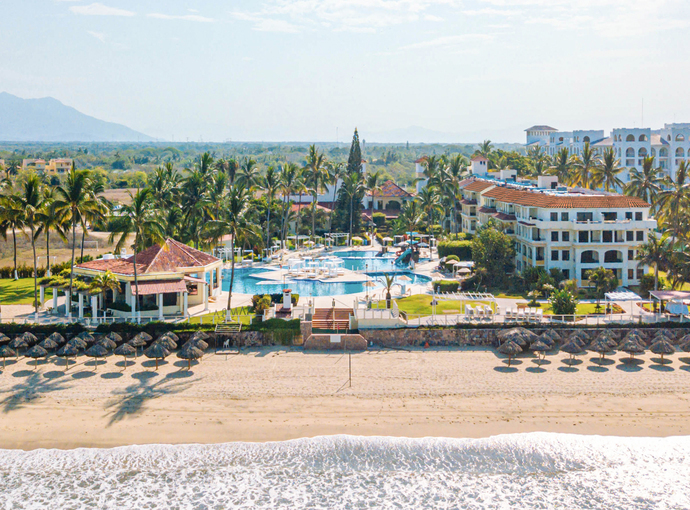 Inside these rooms you'll find convenient amenities and services that will help you to get the most out of your time in the picturesque Riviera Nayarit. Each one has wonderful views, making them great for relaxing. $ 466	$ 223	1 Room Total 4 Nights $ 890Taxes and fees not included. The hotel allows cancellation without surcharge up to 16 days before arrival, from 15 days to 24 hours due to arrival applies 2 nights penalty. In case of No-show complete booking will be charged. $ 504	$ 241	1 Room Total 4 Nights $ 963Taxes and fees not included. With stunning views from the terrace, this suite has a spacious bedroom, 1.5 bathrooms, a living area with a sofa bed, a kitchenette, a minibar restocked daily, a coffeemaker, air conditioning, cable TV and more. $ 534	$ 255	1 Room Total 4 Nights $ 1,021Taxes and fees not included. $ 578	$ 276	1 Room Total 4 Nights $ 1,103Taxes and fees not included. Stay in this comfortable guestroom with its spacious living area and separate bedroom. Designed in a charming Mexican style with a tropical touch, each suite features marble floors and convenient amenities in a relaxing atmosphere. $ 659	$ 314	1 Room Total 4 Nights $ 1,257Taxes and fees not included. These spacious and beautifully appointed guestrooms are perfect for those celebrating an anniversary or honeymoon. They feature amenities like a mini-bar, coffeemaker, air conditioning and a flat-screen TV with cable service. These rooms provide guests with additional benefits, including a bottle of sparkling wine, snacks, a romantic dinner, couples massage and more. $ 671	$ 320	1 Room Total 4 Nights $ 1,281Taxes and fees not included. $ 733	$ 350	1 Room Total 4 Nights $ 1,401Taxes and fees not included.